Whether you're an out of town guest or finally coming HOME for the first time in Forever-the folks in Jackson want you to feel as welcome as the springtime BLUEBIRDS! We've got four days of family-friendly FUN in store for you and it's ALL to benefit Friends of Children's Hospital and Blair E. Batson Children's Hospital - the only hospital in Mississippi where any child can be treated, regardless of ability to pay. So, COME EARLY AND STAY LATE! The three-day weekend includes nine events, including the new Color Me Rad 5k, the return of St. Louis' most famous horses and the award-winning Zippity Doo Dah® Parade. 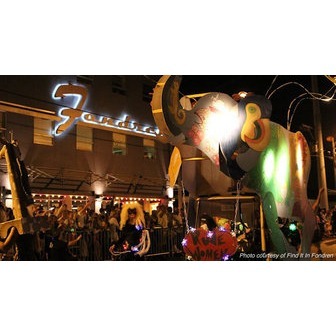 Fondren's Zippity Doo Dah® Weekend is presented by Fondren Renaissance and benefits Friends of Children's Hospital - Mississippi's only children's hospital in the heart of Fondren. Last year's parade attendance was estimated at over 20,000 and the parade featured visitors from nearly all 50 states and several foreign countries. In two years, the weekend's events have raised over $110,000.00 for Friends of Children's Hospital. Kicking off the family friendly weekend will be the world-renowned Budweiser Clydesdales courtesy of Southern Beverage. The Clydesdales will be in Fondren throughout the entire three-day Fondren Zippity Doo Dah® Weekend beginning with Arts, Eats & Beats. Get up close and personal each evening and then view The Clydesdales in Saturday's nighttime parade. "Southern Beverage Company is proud to present the Budweiser Clydesdales in support of Friends of Children's Hospital during the Zippity Doo Dah® Weekend. The Budweiser Clydesdales will make several appearances during the week, and we are honored to be a part of such a great event that helps so many children and families. We hope that all of Mississippi will come see the Clydesdales and support the Batson Children's Hospital during this great family fundraising event organized by Fondren Renaissance," said Theo Costas of Southern Beverage Company. Continuing Thursday evening, March 22, will be what has become known as Fondren's "official rites of spring" - Arts, Eats & Beats. This evening features the eclectic musical and artistic offerings of the Fondren area while encouraging patrons to explore the entire business district. In addition to merchants and restaurants staying open late, music fills the streets in a party atmosphere for all ages. Come hear a variety of bands throughout the district with special performances on the main stage located on Duling Avenue. This event is free and open to the public. On Friday, March 23, The Big Hat Luncheon at Sal & Mookie's will take place at 11 a.m. This is a ticketed event and seating is limited. New this year will be a battle of the cake decorators competition. Using the big hat theme, area bakers will use their culinary skills to impress local and celebrity judges to vie for the title of "best hat". A judging of all personal hats will also take place and prizes awarded. Another new event this year will be a Fashion Runway Show at The Cedars coordinated by Social South Magazine. Held on the historic grounds of The Cedars at 4450 Old Canton Road, this high energy fashion show will highlight the best of all that Jackson specialty boutiques have to offer. From the latest fashion color palette to the "must have" accessories for Spring, this will be one runway show that everyone goes away talking about. Held Friday, March 22 at 11 a.m., this event will feature a catered lunch - ticket required. On Friday evening, Fondren will once again host "The Bouffants" on the main stage on Duling Avenue. This event is free and open to the public and will also conincide with the "Clydesdale Restaurant Hop", an event that takes the world famous horses on a tour of all the restaurants in the Fondren area. On Saturday, March 23, two additional events have been added to the weekend line-up: a character breakfast at Walker's Drive-In begins at 8 a.m. and will feature mascots, food and a children's activity area. This is a ticketed event. Beginning at 9 a.m., the Color Me Rad 5k run and walk begins in the Mississippi Veteran's/JSU Stadium parking lot. In this nationally-recognized race, adults and children alike will arrive in white and run or walk through Fondren to be "color bombed" at each kilometer. "The result is a neighborhood washed in a rainbow of colors," said Jim Wilkirson, Fondren Renaissance Executive Director. Registrants enter the promo code "Fondren" at checkout at colormerad.com so that 20% of their race fees benefit Friends of Children's Hospital. Also on Saturday, two children's carnivals will run throughout the day beginning at 10 a.m. The Sal & Mookie's Children's Carnival on the Mississippi Veteran's/JSU Stadium green space off State Street and the Batson Children's Hospital Jump Zone on Duling Lawn. There is an armband charge good for both carnivals. Continuing on, the weekend ends with Saturday night's Zippity Doo Dah® Parade. The nighttime parade begins at dusk and features the world famous Budweiser Clydesdales, the Jackson State Sonic Boom, the infamous march of the Sweet Potato Queens® and the original Sweet Potato Queen herself, Jill Conner Browne. Grand Marshal of this year's parade is Sweet Potato Queen Aunt Fay of Texas who has just celebrated her 100th birthday. In honor of her birthday, this year's theme will be "We still got a lotta zip in our doo dah." A special fundraising effort leads up to the weekend festivities: Friends of Children's Hospital presents the Patty Peck Honda Doo Dah Day™ Blue Car Giveaway, a raffle of a brand new 2012 Honda. Tickets are $25 and only 3,000 will be sold. The winner will be announced Saturday, post Color Me Rad 5k. A raffle to win a chance to ride on the Budweiser Clydesdale hitch in the parade will be announced in the coming weeks as well.